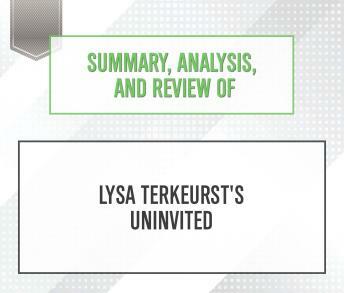 Summary, Analysis, and Review of Lysa TerKeurst's Uninvited PLEASE NOTE: This is a key takeaways and analysis of the book and NOT the original book. Start Publishing Notes' Summary, Analysis, and Review of Lysa TerKeurst's Uninvited: Living Loved When You Feel Less Than, Left Out, and Lonely includes a summary of the book, a review, analysis & key takeaways, and a detailed About the Author section. PREVIEW: Uninvited: Living Loved When You Feel Less Than, Left Out, and Lonely is an inspirational Christian book. Author Lysa TerKeurst discusses her own experiences with rejection, and urges readers to turn to faith for comfort and love. Rejection from others in the present uncovers wounds in the past. Rejection by others intertwines with self-rejection. These messages of rejection and self-rejection become self-fulfilling; when you internalize rejection, you damage your own ability to interact honestly, openly, and generously with others and with God.